Abstract. Black carbon (BC) aerosols in the atmosphere strongly affect radiative forcing. They are mainly removed from the air by wet deposition, and their lifetime is controlled by their water uptake ability or hygroscopicity, which is a function of aerosol mixing states. It is well known that atmospheric aging processes coat various materials on BC aerosols and affect their mixing states and hygroscopicity. However, detailed relations between the aging processes and the hygroscopicity and mixing state of BC aerosol particles in polluted city areas are not well understood. Here, we studied the temporal variation in hygroscopicity and its correlation with the mixing state of ambient BC particles during the summer of 2017 in Shanghai, China, using a hygroscopic tandem differential mobility analyzer inline with a single-particle soot photometer (HTDMA–SP2 system) as well as a single-particle aerosol mass spectrometer (SPAMS). BC particles with 120, 240, and 360nm in dry diameter were humidified at relative humidity (RH) = 85%. After humidification, particles with growth factors (GFs) of 1.0, 1.2, and 1.4, representing the BC particles with different hygroscopicities (hydrophobic, transition, and hydrophilic modes, respectively), were analyzed with a SP2 to obtain their BC mixing states. 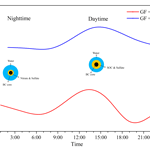 The diurnal trends in coating thickness and chemical mixing state show that coating materials of BC particles were distinct between daytime and nighttime. The differences were associated with the hygroscopicity of BC particles. Single-particle mass spectrometry and other chemical characterization techniques revealed that with lower temperature and higher RH during nighttime, formation or condensation of nitrates resulted in an enhanced hygroscopicity of BC particles. During daytime, secondary organic carbon formation was mainly responsible for the change of hygroscopicity of BC particles. Due to the high hygroscopicity of inorganic nitrate, a thinner nitrate coating on BC particles could convert fresh BC particles to aged hygroscopic ones during nighttime while a thicker coating layer of secondary materials was required to reach the same overall hygroscopicity during daytime because of the participation of secondary organic carbon. Different atmospheric aging processes between daytime and nighttime led to the change of BC particles' mixing states, which play a fundamental role in determining their hygroscopicity. To our knowledge, this is the first report of links between temporal variations in the hygroscopic growth of BC particles and atmospheric aging processes in polluted environments. These findings have significant ramifications in understanding the aging process, wet removal, and climate effects of BC particles. How to cite: Li, K., Ye, X., Pang, H., Lu, X., Chen, H., Wang, X., Yang, X., Chen, J., and Chen, Y.: Temporal variations in the hygroscopicity and mixing state of black carbon aerosols in a polluted megacity area, Atmos. Chem. Phys., 18, 15201-15218, https://doi.org/10.5194/acp-18-15201-2018, 2018. Temporal variation in the hygroscopicity and its correlation with the mixing state of ambient BC particles were studied using a HTDMA–SP2 system. 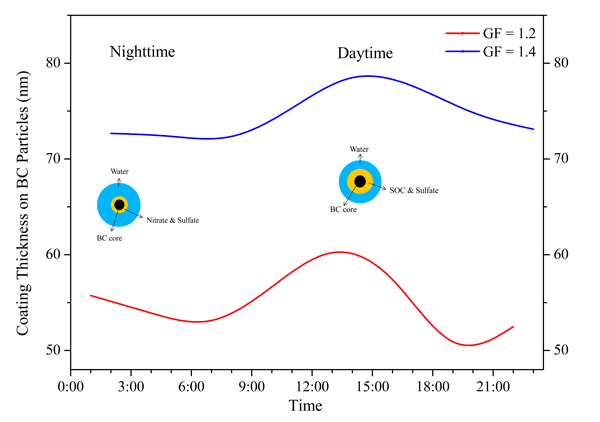 Secondary organic carbon formation and condensation of nitrates were mainly responsible for the changes of hygroscopicity of BC particles during daytime and nighttime, respectively. Different atmospheric aging processes led to the change of BC particles' mixing states, which play a fundamental role in determining their hygroscopicity.